Leisyte, L., Peksen, S., Zelvys, R., & Rose, A.-L. (2019). Humboldt revisited – teaching and research at Lithuanian universities. Presentation at the APIKS project conference "An International and Comparative Study of Academics’ Teaching and Research – Activities in the Knowledge Society: Main findings from the APIKS project", Hiroshima University, Hiroshima, Japan, March 4. Leisyte, L. (2018). Gender and Research Excellence. Women in Science Network Annual Event "Diversity in Academia", University of Technology, Eindhoven, the Netherlands, October 1. Leisyte, L. (2018). Strukturveränderungen im US-amerikanischen Hochschulsystem. Konferenz "Hochschulsteuerung und Wissenschaftsfreiheit", Verein zur Förderung des deutschen & internationalen Wissenschaftrechts, Universität Duisburg-Essen, Essen, Germany, October 11. Leisyte, L. (2018). Resistance in European academia: From individual to collective. Comparative Sociology Workshop, Stanford University, Stanford, CA, USA, June 4. Waheed, M. & Leisyte, L. (2018). HyFlex learning: Evaluation of interactive quality and satisfaction. Presentation in Research Seminar at Malmö University, Malmö, Sweden, October 25. Leisyte, L. (2018). Organizational challenges of attracting and retaining academic talent. Presentation at the 34th EGOS Colloquium (European Group for Organizational Studies), Tallinn, Estonia, July 5. Kumpikaite-Valiuniene, V., Leisyte, L., Rose, A.-L., Duobiene, J. & Duoba, K. (2018). Challenges of adjustment of expatriates: The cases of Estonia and Lithuania. Presentation at the 34th EGOS Colloquium (European Group for Organizational Studies), Tallinn, Estonia, July 5. Waheed, M. & Leisyte, L. (2018). Unearthing quality of knowledge, interaction, and virtual competence in the digital learning. Poster presentation at the JURE 2018 conference, Junior Researchers of the European Association for Research on Learning and Instruction (EARLI), University of Antwerp, Antwerp, Belgium, July 4. Waheed, M. & Leisyte, L. (2018). Knowledge quality and learning outcomes in eLearning: Malaysian students’ perspective. Presentation in Research Seminar at the School of International Business and Entrepreneurship, Steinbeis-Hochschule, Herrenberg, Germany, June 7. Waheed, M. & Leisyte, L. (2018). Quality assurance in digital learnings. Presentation in Research Seminar at Linköping University, Linköping, Sweden, April 20. Zeeman, N. & Leisyte, L. (2018). Academic collective resistance and managerial reforms in higher education. Presentation at the 13th Annual Conference of the German Association for Higher Education Research (Gesellschaft für Hochschulforschung, GfHf), Speyer, Germany, April 13. Leisyte, L. (2017). Challenges of adjustment of expat knowledge workers in Central and Eastern European context. Open lecture at a seminar of the project "Adjustment of Expatriates in the Baltic States", Kaunas University of Technology (KTU), Kaunas, Lithuania, September 22. Waheed, M. & Leisyte, L. (2017). European students’ perspective on learning from digital learning environment: The potential role of quality and competence. Paper presentation at the Network Meeting of the Humboldt Network (Alexander von Humboldt Foundation), Bielefeld, Germany, October 18-12. Leisyte, L. & Zeeman, N. (2017). Interdisciplinary research in German universities. Presentation at the CHER 2017 Conference, Jyväskylä, Finland, August 28. Mergner, J. & Leisyte, L. (2017). The widening participation agenda in German higher education: Discourses and legitimizing strategies. Presentation at 33rd EGOS Colloquium "The Good Organisation", Copenhagen, Denmark, July 8. Leisyte, L. (2016). Academic staff mobility in Central and Eastern European countries. Invited talk at the Conference of the Central European Higher Education Cooperation (CEHEC) "Distinctiveness of Central and Eastern European Higher Education", Budapest, Hungary, June 16-17. Leisyte, L. (2016). Academic entrepreneurship in national innovation systems from a comparative perspective. Talk at the "Forum on Innovative Technologies and Management for Sustainability – 2016 (ITMS'16)", Panevezys, Lithuania, April 28. Rose, A.-L. & Leisyte, L. (2016). Organisational change in German higher education: The emergence of interdisciplinary structures in teaching innovation. Poster presentation at the 1st conference of the project "Dortmunder Profil für Inklusionsorientierte Lehrer_innenbildung (DoProfiL)", Haltern, Germany, November 15-16. Leisyte, L. (2016). Die hochschuldidaktische Qualifizierung der Hochschullehrenden zur Unterstützung eines Transformationsprozesses hin zu inklusionsorientierter Hochschullehre an der TU Dortmund. Presentation at the 1st conference of the project "Dortmunder Profil für Inklusionsorientierte Lehrer_innenbildung (DoProfiL)", Haltern, Germany, November 15-16. Leisyte, L. (2016). Protected academic spaces and institutional entrepreneurs at universities. Presentation at the 29th Annual Conference of the Consortium of Higher Education Researchers (CHER), University of Cambridge, UK, September 5. Leisyte, L. (2016). Power, protected spaces and institutional entrepreneurs in higher education. Presentation at ECER 2016, Network 22 (Research in Higher Education) Session 10 C (Entrepreneurial Universities and Valorisation), Dublin, Ireland, August 25. Leisyte, L. (2016). Stability and change in power relations at Dutch universities. Presentation at 32nd EGOS Colloquium, Naples, Italy, July 7-9. Leisyte, L. & Sigl, L. (2015). Research commercialization – A story of symbolic compliance?. Presentation at the EU-SPRI Early Career Researcher Conferences (ECC) "Crossing Boundaries in Scientific Knowledge Creation and Transmission: Trends, Challenges and Policy Implications", Rome, Italy, October 15. Leisyte, L. (2015). New Public Management and Research Productivity – A precarious state of affairs of academic work in the Netherlands. Presentation at the European Conference on Educational Research (ECER), Budapest, Hungary, September 11. Broucker, B., De Wit, K. & Leisyte, L. (2015). An evaluation of new public management in higher education: Same rationale, different implementation. Paper for the EAIR 37th Annual Forum 2015 "From here to there: Positioning higher education institutions", Danube University Krems, Austria, August 31. Leisyte, L. (2015). Boundary work of bioengineers: Inside the world of academic entrepreneurs. Presentation at the Earli 16th Biennial Conference 2015, Session J 17, Cyprus, August 28. Broucker, B., De Wit, K. & Leisyte, L. (2015). New public management or new public governance for the higher education sector? An international comparison. Paper for the EGPA Annual Conference, Toulouse, France, August 26-28. Leisyte, L. (2015). University as an entrepreneurial hub: an example from Germany. Presentation at the Academy of Management Annual Meeting (AOM) 2015, PDW 317, Vancouver, Canada, August 8. Hosch-Dayican, B. & Leisyte, L. (2015). Soziale Bewegungen von Akademikern: Neue Akteure im System der Hochschulsteuerung? 10. Jahrestagung der Gesellschaft für Hochschulforschung, Kassel, Germany, April 9. Leisyte, L. (2014). Mokslo kokybės skatinimas pasitelkiant tarptautinį ekspertinį vertinimą (The Internationalisation of academic research for quality improvement of Lithuanian science). Presentation at the conference of the Lithuanian Research Council "Mokslo tarptautiškumas Lietuvos mokslo kokybei gerinti", Vilnius, Lithuania, November 3. Leisyte, L. & Hosch-Dayican, B. (2014). Managerialism and gender inequality in higher education: A case study of performance criteria and career perspectives of female academics in the Netherlands. Presentation at ESA Research Network 33 – Women’s and Gender Studies Mid-term Conference, Naples, Italy, October 16-17. Leisyte, L. (2014). Chair of Session "Policy, Management and Governance in Higher Education". ECER 2014 "The Past, the Present and the Future of Educational Research", Network Session 22 (Research in Higher Education), Porto, Portugal, September 3. Leisyte, L. & Hosch-Dayican, B. (2014). Medieval historians crossing boundaries: Implications for their identities. Presentation at 27th CHER Annual Conference, Rome, Italy, September 8. Leisyte, L. & Hosch-Dayican, B. (2014). Managerial universities and a gendered functional differentiation of academic work: A case of a Dutch university. Presentation at the American Sociological Association (ASA) 2014 annual meeting, San Francisco, CA, USA, August 16. Leisyte, L. & Chatterjee, Debabrata (2014). Organizational responses to vertically nested institutional logics: A study of two universities from Dutch and Indian research systems. Presentation at 30th EGOS colloquium, Sub-theme 60: Rethinking Responses to Institutional Complexity, Rotterdam, the Netherlands, July 3-5. Leisyte, L. & Hosch-Dayican, B. (2014). Towards new actor constellations in higher education and research governance: The emergence of academics' political movements. Presentation at Eu-SPRI annual conference, Manchester, UK, June 20. Leisyte, L. (2014). Resistance in academia – Towards the hybridity of academic identities. Presentation at the 9th Organization Studies Summer Workshop 2014, Corfu, Greece, May 23. Leisyte, L. & Dee, J. R. (2014). Understanding the boundary conditions that foster or impede the flow of knowledge in organizations. Presentation at 2014 International Conference on Organizational Learning, Knowledge and Capabilities (OLKC), Oslo, Norway, April 23. Leisyte, L. (2013). Being an academic in Europe and in the U.S.: Role differentiation, shifting identities and protected spaces. Leisyte, L. (2013). Changes in Lithuanian higher education and research: Being at the crossroads. Keynote at the International Futura Scientia Workshop "Soviet Past and European Future: Endless Transition in Higher Education and Research", International School of Management, Vilnius, Lithuania, November 15. Leisyte, L. (2013). Research commercialization and academic autonomy: Views from the academic heartland. Keynote at the Jean Monet Center, University of Leeds, UK, February, 2013. Leisyte, L. (2013). Researcher mobility in the time of economic crisis. Presentation at the Lithuanian Presidency of the Council of the European Union Conference "Invest in researchers - Better training and careers using new funding opportunities", Lithuanian Academy of Sciences, Vilnius, Lithuania, November 14-15. Leisyte, L. (2013). Academic capitalism in Dutch universities. Presentation at the Annual Meeting of the Society for Social Studies of Science (4S), San Diego, CA, USA, October 9-12. Leisyte, L. (2013). Students' agency in universities' internal quality assurance in Europe. Presentation at the round table: "Student Evaluations of Teaching: Structuring Pedagogy, Academic Work And University Leadership" at the European Association on Educational Research (ECER) Conference, Istanbul, Turkey, September 9-13. Leisyte, L. (2013). Academic roles and identities in the context of the duality between professions and organizations: Evidence from the U.S. and Europe. Paper presented at the ASA annual conference, New York, USA, August 9-13. Leisyte, L. & Hosch-Dayican, B. (2013). Changing academic roles and shifting gender inequalities: A case analysis of the influence of teaching-research nexus on academic career perspectives of female academics in the Netherlands. Manchester Critical Management Studies Conference, Manchester, UK, July 10-12. Leisyte, L. & Westerheijden, D. (2013). Research evaluation and its implications for academic research in the UK and the Netherlands. Paper presented at the Council for European Studies (CES) conference, Amsterdam, the Netherlands, June 25-27. Leisyte, L. (2012). Funding universities: European trends. Invited keynote at the Lithuanian Ministry of Higher Education international conference "The Future Scenarios of Higher Education", Vilnius, Lithuania, May 2012. Leisyte, L. (2012). Local responses to global templates: The Case of the Entrepreneurial University. EGOS conference, Helsinki, Finland, July 2-7. Leisyte, L. (2012). Varieties of capitalism and the entrepreneurial university: A common template but diverse practice? SASE conference, MIT, Cambridge, MA, USA, June 28-29. Leisyte, L., Epping, E., Faber, M. & Westerheijden, D. (2012). Academic freedom and changing focus on student assessment in Dutch higher education. Presentation made in the CHER conference, Belgrade, Serbia, September 10-12. Leisyte, L. (2012). Understanding academic work in the changing institutional environment: faculty autonomy, productivity and identity in Europe and the U.S. Presentation made in the conference on Changing Conditions and changing approaches of academic work, Berlin, Germany, June 4-6. Leisyte, L., Hosch-Dayican, B. & He, Q. (2012). Gender and changing academic work: The case study of the Dutch university. Poster presentation, European Conference on Gender Equality in Higher Education, Bergen, Norway, August 29-31. Leisyte, L. (2012). University performance and individual careers: Balancing gender. Presentation at the FFNT International March 8 celebration event. Enschede, the Netherlands, March 8. Leisyte, L. (2012). Gender in academic leadership: Challenges and perspectives. Presentation at the FFNT International Conference Gender in academic leadership: challenges and perspectives, Enschede, the Netherlands, April 19. Leisyte, L. (2011). Markets in higher education – Quo vadis? Invited keynote at Vilnius University, Faculty of Philosophy, international conference "Transformations of Education Policy: National, Transnational and Supranational Discourse", Vilnius, Lithuania, November 2011. Leisyte, L. & Dobbins, M. (2011). Understanding the governance change in Bulgaria and Lithuania. ECPR conference, Reykjavik, Iceland, August 24-27. Leisyte, L. & Dobbins, M. (2011). Governance changes in higher education in Bulgaria and Lithuania. CES conference, Barcelona, Spain, June 20-22. Leisyte, L. & Enders, J. (2011). Understanding knowledge disclosure of life scientists: A question of contextual and organizational ambidexterity? RESUP conference, Science Po, Paris, France, January 27-29. Leisyte, L. (2010). Changing in higher education governance in Europe: Major trends in internal governance. Invited speaker at the Ministry of Education and Science of the Republic of Estonia, Tartu, Estonia, May 2010. Leisyte, L. (2010). The strategic responses of university researchers to the challenges of higher education and research reforms in England and the Netherlands. Paper presented at the IGS/EUSPRI conference "Tentative Governance in Emerging Science and Technology", Enschede, the Netherlands, October 28-29. Leisyte, L. (2010). University research commercialization policies and their implementation in the Netherlands and USA. Paper presented at the CHER "Effects of Higher Education Reforms", Oslo, Norway, June 10-12. Leisyte, L. (2010). Faculty responses to the Bologna reforms in Lithuania. Paper presented at the Council for European Studies conference "Revenge of the European Model", Montreal, Canada, April 15-17. Leisyte, L. (2009). Balanced mobility: Unparalleled opportunities & underlying challenges. Invited speaker at the Council of Europe/Lithuanian Student Union Seminar, Vilnius, Lithuania, November 2009. Leisyte, L. (2009). University commercialization policies and their implementation in Lithuania, the Netherlands and USA. Paper presented at the EAIR Forum "Fighting for Harmony: Students, Society and the Academy in Tune", Vilnius, Lithuania, August 23-26. Leisyte, L. (2009). University commercialization policies and their implementation in Europe and the US. Paper to be presented at the 4S Annual Meeting Panel "The Privatization of Science: Commercialized Knowing and its Discontents", Washington D.C., USA, October 28 - November 1. Leisyte, L. (2009). 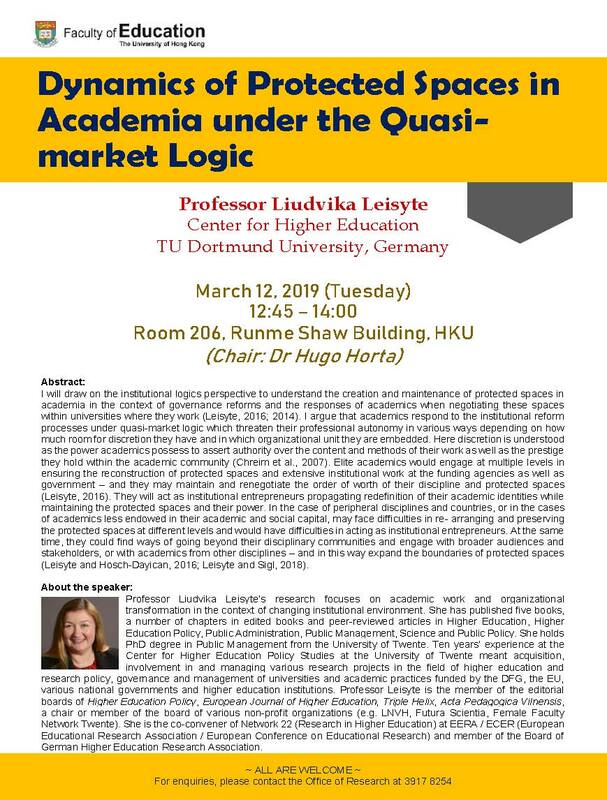 Research on quality assurance policies, practices, and challenges in Europe and the United States: The case of Lithuania. Symposium paper presented at AERA conference "Disciplined Inquiry: Education Research in the Circle of Knowledge", San Diego, CA, April 13-17. Leisyte, L. (2009). The balance between teaching and research in Dutch and English universities in the context of university governance reforms. Paper presented at AERA conference "Disciplined Inquiry: Education Research in the Circle of Knowledge", San Diego, CA, USA, April 13-17. Leisyte, L. (2009). Innovation in the laboratory and beyond: Exploring the world of an academic entrepreneur. Talk given at the Minda de Gunzburg Center for European Studies, Harvard University, Visiting Scholars’ Seminar, Cambridge, MA, USA, April 8. Leisyte, L. (2009). Europe West and East: The challenges of change in higher education. A guest lecture given at the Center for International and Comparative Higher Education, Master Class "International and Comparative Higher Education" of Prof. Altbach, Boston College, MA, USA, April 6. Leisyte, L. (2009). Higher education governance in Europe. A talk given at the Center for the Study of Higher Education, Pennsylvania State University, PA, USA, March 17. Leisyte, L. (2008). How universities change: the Dutch perspective. Invited speaker at Sciences Po. Workshop "Changing Higher Education Governance in Europe", Paris, France, April 2008. Leisyte, L. (2008). New models of steering in higher education. Invited speaker at the OECD Thematic Review of Tertiary Education – Policy Challenges for Flanders, Flemish Ministry of Education and Training, Brussels, Belgium, June 2008. Leisyte, L. (2008). How universities change: The Dutch perspective. Invited speaker for the workshop "Changing Higher Education Governance in Europe" in Sciences Po., Paris, France, April 5. Leisyte, L. (2008). New models of steering in higher education. Invited speaker for the seminar OECD Thematic Review of Tertiary Education – Policy Challenges for Flanders, Flemish Ministry of Education and Training, Brussels, Belgium, June 2. Leisyte, L., Enders, J. & De Boer, H. (2008). The strategic responses of university research units to the changes in research governance in England and the Netherlands in the fields of biotechnology and history. Paper presented at EGOS 24th Colloquium, "Upsetting Organizations", VU University, Amsterdam, the Netherlands, July 10-12. Leisyte, L. (2008). Changing practices of university biotechnology research units in England and the Netherlands. Paper presented at EASST/4S Annual meeting, Rotterdam, the Netherlands, August 20-23. Chaired the session. Leisyte, L. (2008). Professional autonomy in English and Dutch universities: The influence of reforms on the research practices in public research universities. Paper presented at PRIME conference, Mexico City, Mexico, September 24-26. The winner of the Best Early Career PRIME paper. Leisyte, L., van der Steen, M. & Enders, J. (2008). Beyond the isomorphistic view of the academic entrepreneur: An empirical exploration of norms and values of knowledge dissemination of university scientists. Paper presented at PRIME conference, Mexico City, Mexico, September 24-26. Chaired the session. Leisyte, L., Enders, J. & De Boer, H. (2008). The balance between teaching and research in Dutch and English universities in the context of university governance reforms. Paper presented at BRICK-DIME workshop "The Economics and Policy of Academic Research", Torino, Italy, July 14-15. Leisyte, L. (2008). Higher education and research policies and professional autonomy in England and the Netherlands; The influence of reforms on the research practices in public research universities. Paper presented at the AERA conference, New York, USA, March 23-28. Van der Steen, M., Leisyte, L. & Enders, J. (2008). Beyond one-size-fits-all research excellence in higher education; An empirical analysis of research units in the Netherlands and the United Kingdom. Paper presented at the CHER Conference, Milan, Italy, September 2008. Leisyte, L. (2007). Research practices in English and Dutch universities. Poster presentation at the ASHE 32nd annual conference "Informing the Public Agenda for Higher Education: The Role and Relevance of Research", Louisville, USA, November 7-10. Leisyte, L. (2007). NPM effects on research practices in English and Dutch universities. Paper presented at the Atlanta Conference on Science, Technology and Innovation Policy "Challenges and opportunities for Innovation in the Changing Global Economy", Georgia Technology University, Atlanta, GA, USA, October 18-20. Leisyte, L. (2007). Research policies and professional autonomy in England and the Netherlands; The influence of reforms on the research practices of the basic research units in public research universities. Paper presented at annual CHER conference "The Research Mission of the University", Dublin, Ireland, August 30 - September 1.